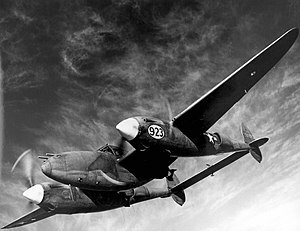 The P-38 Lightning is a World War II fighter aircraft made by Lockheed. It was mainly used by the United States Air Force. It first flew in 1939. It was different from other fighters because it had two engines instead of one, and was twice the size of other fighters. The plane fought in the Pacific and in Europe. It could carry 4 50-caliber machine guns and a 20mm cannon. With a top speed of over 400 miles per hour the P-38 was one of the fastest fighters of its time. The P-38 is also accounted for capturing 90% of all aerial footage over Europe. By 1944, it was replaced by the faster P-51 Mustang in Europe. The P-38 was the only American fighter being built at the beginning and the end of the war. The Germans called it the "fork tailed devil." ↑ Bodie 1991, pp. 200–201. ↑ "Honduran Air Force." aeroflight.co.uk. Retrieved: 10 October 2010. ↑ "Army Air Forces Statistical Digest – World War II. Table 82—Average Cost of Airplanes Authorized, by principal model: Fiscal Years 1939–1945". Archived 2 November 2012 at the Wayback Machine maxwell.af.mil. Retrieved: 7 February 2009. This page was last changed on 10 August 2018, at 16:35.